Resource Natural Spring Water + gift card giveaway! Recently, I was sent two bottles of Resource natural spring water to sample and review. It's 100% sustainably sourced, contains natural electrolytes, has a clean fresh taste, and the bottle is made out of 50% recycled materials. Resource is a division of Nestlé Waters North America. Although the fact that a cookie company is packaging "healthy water" kind of makes me skeptical, the fact that they include a five page quality report for Resource spring water in their website makes me think it's a legit product after all. The packaging is basic and clean looking, and the bottle is easy to hold in an adult hand. My fiancé and I each taste-tested a bottle. I figured he would be a better judge since he only drinks water that's bottled or filtered (I'll drink it from the tap but I prefer adding Crystal Light). We were both impressed by this water and we were amazed by how smooth it tastes. It doesn't have any underlying odors or aftertaste, which we haven't come across before. It's weird because it tasted even more pure than bottled or filtered water! But we both liked it. Although I prefer to use a reusable Nalgene and to use the Brita filter at home since its better for the environment, if I needed bottled water for some reason, I would definitely choose to buy Resource spring water. 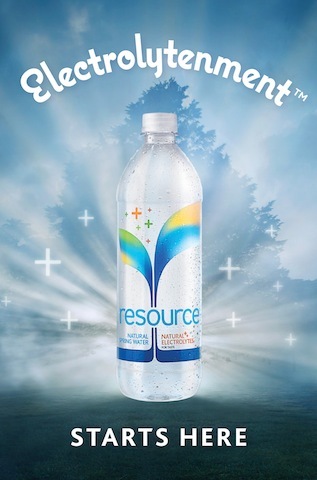 Content and/or other value provided by our partner, resource natural spring water. Also, Resource spring water has offered to do a giveaway for a $25 Spa Week gft card! You can use it t over 5000 locations nationwide. I found several local health and wellness places (salons, yoga studios, etc.) near where I live that accept these gift cards, and you can too using the location finder at spaweek.com. To enter the giveaway, use the Rafflecopter form below. Disclosure: I will also receive a $25 Spa Week gift card in exchange for hosting this giveaway. I meant to update from my iPhone during the race using the Weebly app, but coverage was spotty to nonexistant for most of the race. So here's what happened to Team 518 - the Trail Nuts. Our van felt pretty good after our first set of six legs. All of us had run strong and fast. We grabbed dinner and took showers at a teammate's house, and then went to meet up with Van 2 near OMSI for the exchange. I ran Leg 13 (4.21 mi) through downtown Portland around 7pm. The temperature was just right and it was a nice, fairly flat run. My legs were a little tired and stiff, but I managed to finish in 39:45 (9:22 min/mile pace). I got a little sleep in the van while my teammates ran their legs, and on our way to the next major exchange. A fire had shut down part of highway 30 and caused a couple of changes. Traffic was pretty bad along other parts of the course anyway, so it got a little stressful in our van. Everything was kind of a blur until I had to run my last leg at 5am. Leg 25 (3.75 miles) is in the middle of nowhere on a country road (technically from Mist to Birkenfeld, OR). It was dark and I was tired and just wanted to sleep and eat and sleep some more. I ran as fast as I could make myself run, which ended up being kind of slow (10:30-11:00 min miles I think?). I was really glad to be done, and slept some more until our van finished our last set of legs and could head to the beach to wait for Van 2 to finish. Once Van 2 arrived at the beach, and the last runner came in, we all crossed the finish line together. Our team was 350th overall (out of 1070 total teams), and 77th out of 362 teams in the Mixed Open. We skipped the beach party in favor of the food and drinks that were waiting for us at the beach house we rented, where we ate and drank and fell asleep by 9pm. Yep. We were pretty tired. I almost didn't run Hood to Coast this year, but my team pretty much made me do it. Who you run/live with in a van for three days makes all the difference in the world, and I'm lucky to have such awesome running buddies. We all ran hard and had a good time, in spite of all of the crazy stuff and lack of sleep. We were all pretty disappointed by how Hood to Coast was run this year (although the volunteers did an awesome job, as always--thank you so much! ), so we're considering finding a different relay for next year. Can&apos;t believe I agreed to do this for the third year, but I love my team, and I really love my van mates. Finished leg 1 (5.64mi) in 46:36. Felt good coming down from Timberline but my legs are feeling a little rough. Post-run DQ Blizzard, fries and Orange Julius are helping me recover. Our team captain ran leg 2 and also needed some post run DQ. Now on Netflix: The Glades!!! and Warrior!!! Netflix had been pretty disappointing as of late. I was spending a lot of time flipping through TV shows and movies, but not finding anything worth watching. But all of that has changed now that they've added one of my favorite shows and one of my favorite movies. Neither of them is hugely popular, but they're both very good. First off: The Glades. It's a TV series about Detective Jim Longworth, who is charmingly annoying. I don't usually watch police shows, cuz they're too violent and icky for me. But this show is different. It combines witty humor with clever sleuthing, and just a tiny bit of a love story, and the crimes have usually already taken place so there's not a whole lot of violence and stuff I can't watch. The Glades is a pretty universally friendly TV show. It's on it's third season on A&E. Also, Warrior (2011) is now on Netflix. When I first saw trailers for this movie, I thought to myself, "Oh jeez, another brothers fighting each other movie, but using MMA instead of boxing. I hate MMA." And no body I knew watched it or said anything about it, until my fiance was bored and decided to watch it. He loved it and insisted that I watch it. So I watched it. And it was amazing. Yeah, it's about two brothers who end up beating the crap out of each other. But all of the characters are so complex and so incredibly HUMAN, that you inevitably get drawn in to the story and their personal struggles. And I love Tom Hardy. Have you seen either of these? Do you have any Netflix recommendations? I love Sally Hansen&apos;s nail polish strips. They&apos;re pricy but a nice little treat that costs less than a mani, and they&apos;re reasonably easy to apply at home. Occasionally they&apos;re in sale, so while they&apos;re not something I can afford to use all the time, they&apos;re a good reasonably priced option for a fancy set of nails for a special occasion. I bought the Kiss Nail Dress strips thinking they were practically identical. They&apos;re about the same price wise ($8 ish) and looked the same in the box, but these came with more size options per box than the Sally Hansen ones. But I was sooo wrong about them being anything alike. These are more like plasticky stickers. It was difficult to get them to apply without wrinkling. Filing off the free edge was difficult and left the edges a little scratchy and raggedy. The design was super cute and shiny so it looked decent enough... Until the next day. Within 24 hours there was pretty bad tip wear. And the wrinkles were driving me up the wall. So I removed them by peeling them off, as per the directions. It was easy enough except that it left a thick sticky film that I had to use acetone to remove. I&apos;d say avoid these. I wouldn&apos;t even use them if I received another set for free.